Does Apple “Wiretap” Your FaceTime Calls? VLC media player offers everything that you would need to play your video files. It comes with tonnes of customization options. However, recently while playing a movie on VLC media player, I could not hear the audio. The video was playing fine but without any sound or audio. The first thing I did was check my Volume level, and it was fine. Restarted the PC, but the problem did not resolve. Just to make sure that my speakers are working fine, I logged into YouTube and played a video which worked perfectly fine with the audio. So, the problem was with the VLC media player or the settings. So, today in this post, I will be listing the best ways to fix VLC Media Player audio issues. Things you should do before following any of the methods given below. Restart your PC: Now this is the most common suggestion anyone would provide. At times, the problems could be temporary, and a quick restart might fix the issue. Play a video Online: Make sure you speakers or the headphone is working fine by playing a video on YouTube in case you cannot hear the Audio on even the default Windows media player. This has to be the first thing that you should check in case the audio is not playing in VLC Media Player. You might have accidentally muted the VLC Media Player audio and now facing the issue. Open VLC Media Player, go to Audio. At the end of the option, click on Mute. Now look at the bottom right of VLC media player. If the volume indicator is in Green, then you have unmuted the Audio. If it is in Grey, you have muted the Audio. The same Mute option works for both muting and unmuting the Audio in VLC Media Player. Enable Audio: You may also want to check if the Audio is enabled or disabled in VLC Media Player. Go to Tools and select Preferences. Click and open Audio tab. Check Enable Audio option if it is unchecked. Click on Save to save the settings. Close VLC Media Player and open it again. VLC media player has audio device option which allows you to select your preferred audio devices such as Speakers or the headphones for listening to the audio. However, when you install VLC Media Player, it sets the audio device to default which can create audio is not playing problem. To fix VLC playing video without an audio problem, you have to change the audio device from the settings. Open VLC and click on Audio. Go to Audio Device. Here the Audio Device should be already set to Default. You have to change it to Independent RTC Headphones or Speakers / Headphones. If you are using a Headphone, then select Independent RTC Headphones. Note: If you have different options from the one mentioned above, then try them instead and see if that resolved the issue. Now play the video which had the problem and you should be able to listen to the audio. Another easy solution to fix the audio is not playing issue in VLC Media Player is to reset preferences in the app. Doing so, you will reset the app’s preference settings and restoring it back to the default settings. To do this, Open VLC Media Player and click on Tools. At the bottom, click and open Preferences. Under Preferences, scroll down and at the bottom left click on Reset Preferences. A pop-up notification will appear asking you to confirm the VLC Media Player reset preferences option. Click OK to proceed. If necessary follow fix 1 again to resolve the issue. You may also face problems with Audio in VLC Media Player or any other Media Players in your PC if the sound devices are disabled in Sound Settings. To fix this, do the following. Open Control Panel and open Hardware and Sound. Click and open Sound. It will open Sound dialogue box. In the Playback tab, you should see all audio devices listed. Right-click on all the Audio Devices and select Enable. If you don’t find any audio devices, right-click on an empty area and select Show Disabled devices. Click on Apply and OK to save the settings. Now restart your PC and you may have your PC playing Audio again. Changing Audio output module are some advanced audio settings that you may not have to use ever. However, if you are unable to resolve the audio is not playing problem in VLC media player. To do this, do the following. Open VLC Media Player, click on Tools and select Preferences. Under Simple Preferences, click the Audio tab. In the Output section, click the drop-down menu beside Output Module and select WaveOut Audio output. Below that, click on drop-down menu beside Device and select Speakers / Headphones. Click on Save to save the settings. Close VLC Media Player and restart it. There is one more option in the VLC Media Player that can cause the Audio is not playing problem. You can try enabling or disabling the S/PDIF option in VLC Media Player to resolve the Audio issue. In the Audio settings, go to Output section and click the drop-down menu. Select WaveOut Audio Output. Below that, check Use S/PDIF when Available. If already checked, uncheck Use S/PDIF when Available. Click on Save to save the settings. Close and restart VLC Media Player start playing the video to see if the audio issue has been resolved. Open VLC Media Player and play the video. Minimize the VLC Media Player window. Now from the desktop, right-click on Volume icon ( bottom right) in the Taskbar and select Open Volume Mixer. Select any Audio Device and in the Application section, increase the volume for VLC Media Player. Close the Volume Mixer and see if the audio problem has been resolved. Open VLC Media Player and play the video. While the video is playing, click on Audio >> Audio Track and select disable. Again go to Audio >> Audio Track and select Enable. 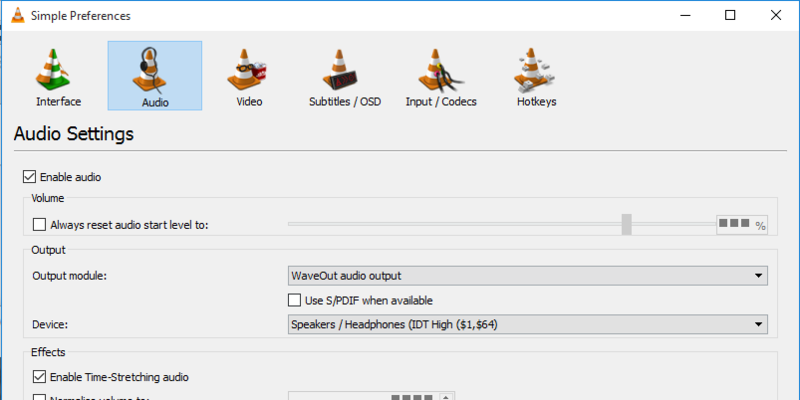 This may help you resolve the audio problem in VLC media player. If nothing seems working, you may try to troubleshoot sound problems. 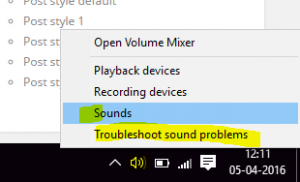 Right-click the Volume icon in the taskbar at the right-side bottom and select Troubleshoot sound problems. Wait till the Troubleshooter detects the problem. Next, select the audio device for which you want to check for audio problems. Click Next to proceed. 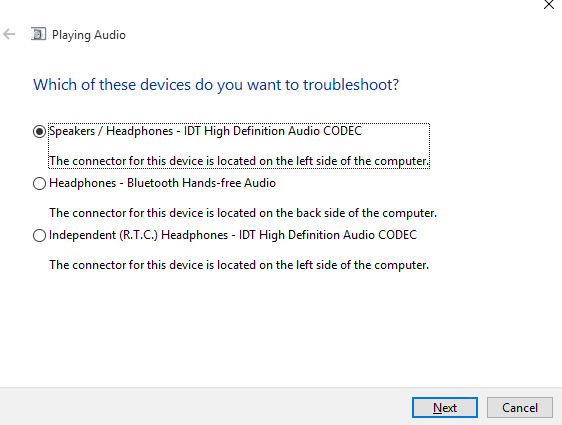 Wait until the troubleshooter detects and recommends any solution to fix the audio issue. It worked for me when I was in need…. Is this steps working in windows 10 after installing corel draw x3? Cause i’Ve already incounter Vlc Midea player audo problem after installing corel draw x3. I am not sure If installing Corel Draw X3 has anything to do with the audio issue. Do try them and see if it works. Thank you so much! This was the only (and perfect) help I found online. I am a Mac user. I tried some of the above but it did not seem to work. Then I went to VLC–preferences —audio —reset all. That solved the problem for me. Subscribe to our weekly mailing list and get updates to your email inbox. @2018 - TechXoom. All Right Reserved.